I have been waiting for a long time to be able to see Amaranthe perform live. Last year, I couldn't attend one of their gigs because of a heavy musical schedule and that's the reason why I was particularly pleased to be in London at the same time as their 'Maximum Evocation' tour came through. In fact, it was also a co-headline tour with Eluveitie, and it was the first time for me attending such a shared gig. The support act was the Dutch band The Charm The Fury. I had already seen them once before in early 2016 when they opened for Delain. The first thing I can say is that they have become much more self-confident than they were almost two years ago. Caroline Westendorp, the lead singer, brings an impressive and powerful charisma that ensures the audience has been suitably warmed up during their thirty minute set. This was an intense Metalcore session before they cleared the stage for Amaranthe. I've always been seduced by the music of Amaranthe. The studio records and overall sound is pretty interesting given it's a mix between Power Metal, electronic instruments and sometimes even featuring Pop parts. 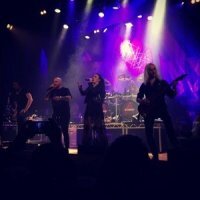 For those unfamiliar with the band, they are make use of three singers with very different styles; two males (growl and clean) and one female, the front-woman Elize Ryd. However, this evening one singer was missing and the band had asked a friend, Chris Adam from Smash Into Pieces, to replace him for couple of gigs. Without going through the whole set-list, Amaranthe played eighteen songs covering their four albums – 'Maximalism' (the latest and one being promoted this tour), 'Amaranthe', 'The Nexus' and 'Massive Addictive'. Given the quality if the albums and the fact I like all four, I was expecting a high-quality show. However, I was left very disappointed. The band played with almost no interaction between the songs, therefore creating no link with the crowd. I don't know if this was due to the event being a co-headline format with Eluveitie, but I certainly didn't like this concept of playing as many songs as possible in quick succession and then exit the stage. However, it got worse because to me the show came across as a complete mess on stage. The sound, which is so good on studio records, sounded awful live; the electronic aspect, the Metal aspect and then three singers – it was too much for me. I felt Ryd was also over acting which left me with the impression that she behaved like a diva and pushed her voice way too much and degraded the quality of the music. After one hour and thirty minutes, I definitely couldn't get into it. I prefer to think that it was a problem with the venue or the sound preparation, but I'm not sure if I will attend another show by this band. Maybe I should keep listening to the studio records and leave it at that. I was expecting a lot and I was left very disappointed! Please note - my apologies for not being able to cover Eluveitie as I was unable to stay for their performance.